Everyone is always trying to persuade us of something: politicians, advertising, the media, and most definitely our families. 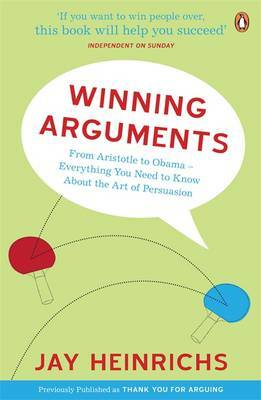 With all the wisdom of the ages, from Aristotle and Stalin to Yoda and Monty Python, "Winning Arguments" will show you how to win more than your fair share of arguments, as well as: how to shine at work, avoid speeding tickets, and outwit argumentative partners; Cicero's secrets to moving an audience and Honest Abe Lincoln's 'shameless trick'; and, tactics like Setting Your Goals, Making Them Listen and Gaining the High Ground. The art of rhetoric, from eloquence and friendship to ready wit and irrefutable logic "Winning Arguments" is brimming with endless examples of persuasion and plenty of techniques to help you get your way.